Location: County Road 518 at County Road 24, Money, Miss. On August 21, 1955, 14-year-old Chicago-native Emmet Till and his cousin, Curtis Jones, skipped church with a group of friends to buy candy from Bryant's Grocery & Meat Market in Money, Mississippi. The store was owned by 24-year-old Roy Bryant and his 21-year-old wife, Carolyn, who happened to be alone at the store that day. After Till showed the other boys a picture of a white girl he claimed was his girlfriend, they dared him to approach Bryant. Despite his mother's warning that Mississippi was nothing like Chicago, he proceeded, and what transpired continues to be debated to this day. It's possible that Till whistled at Bryant, as one publication revealed that he sometimes whistled to combat the stuttering he experienced after a bout of childhood polio (his mother, Mamie Till Bradley, explained that the letter "b" gave him extra trouble). Others claim that Till hit on Bryant, and she insisted that he grabbed her waist and inappropriately asked her out. When Roy Bryant found out what happened, he and his brother-in-law, John William "J.W." Milan, kidnapped and beat Till severely before shooting him. They then used a 70-pound fan to weigh his body down in the Tallahatchie River. Three days after his abduction, two boys discovered his horribly disfigured body. At Till's funeral, his mother demanded that his casket remain open so the world could see what had happened to her son. The disturbing images were published in The Chicago Defender and Jet, gaining the attention of the NAACP and mobilizing the Civil Rights Movement. 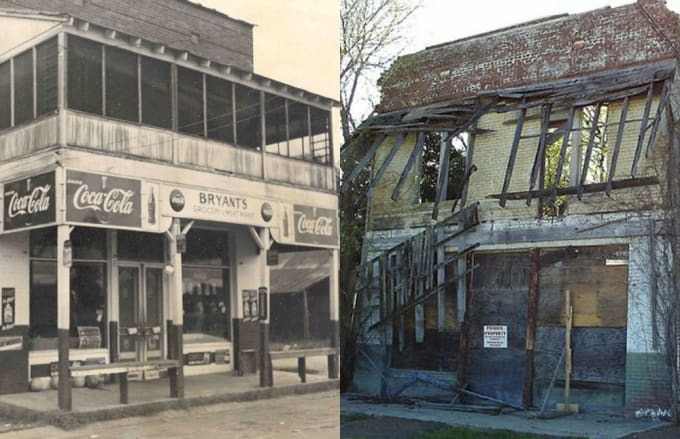 Currently, Bryant's Grocery and Meat Market is in poor condition due to years of neglect and damage inflicted by Hurricane Katrina. However, a historic marker recognizing the decaying building as part of the Mississippi Freedom Trail was added last spring for the 50th anniversary of the Freedom Ride.